Our story is a lot like our beer; unconventional. It’s the story of a semi-lost 20 something year old with a young family, who fell in love with the art and science of brewing beer, instead of finishing college, like he was supposed to. He may well still be brewing in his garage at this very moment, if his retired father, Gary had not believed in his son, and offered to join him in business. Greg, with one small child and another on the way, somehow convinced his wife, Natalia that moving across two states and buying into a failing brewery was a good idea. If nothing else, Greg is persuasive. Three months into the social experiment, Gary, Greg’s dad had the inspired idea to bring in Greg’s good high school friend, Ross as a partner. Granted Ross was an English major (which has nothing to do with beer? ), but hey, the guy can talk to anybody. And well, they did what anybody would do in their shoes. Worked all hours of the day for wages below poverty level. Talked to the people, found out what they wanted and made it. Poured beer at festivals all over the state. Shook hands. Begged for placements at bars. Picked up spare change off the sidewalk. Made big mistakes. Figured out how to correct them. Learned a few things the easy way. Learned a lot of things the hard way. And were grateful that at least they had access to nearly free beer. 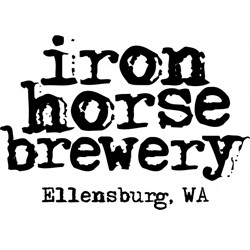 In the process of struggling to make something out of very little, they figured out what Iron Horse Brewery really stood for. They weren’t making beer to please the critics of the world, they were making craft beer for people. There are a lot of rules and regulations about how things should be, and when it comes to their beer and their lives, they don’t care about rules. They care about innovation, taking risks, and authenticity. With that core belief intact you have the Iron Horse Brewery of today; Greg continuing to push the envelope, Ross using a vernacular more appropriate to classical literature than selling beer, Gary suggesting barrier-busting, painfully optimistic future plans, Natalia still working in the business for the sole purpose of keeping Greg in check, and an amazing staff that keeps Iron Horse Beers moving into the hands of the people. You’re welcome.